At the 2018 New York International Auto Show, Hyundai Motor celebrated the world premiere of the new updated Tucson, the redefined version of Hyundai’s most important sales driver worldwide (including in Ireland ). The Tucson has been Hyundai’s best-selling car in Ireland, the UK and Europe in recent years. Designed and built in Europe, Hyundai’s new compact SUV enters the market with refreshed, eye-catching design, revised powertrain line-up and more advanced technology and convenience features to satisfy modern customers’ needs. 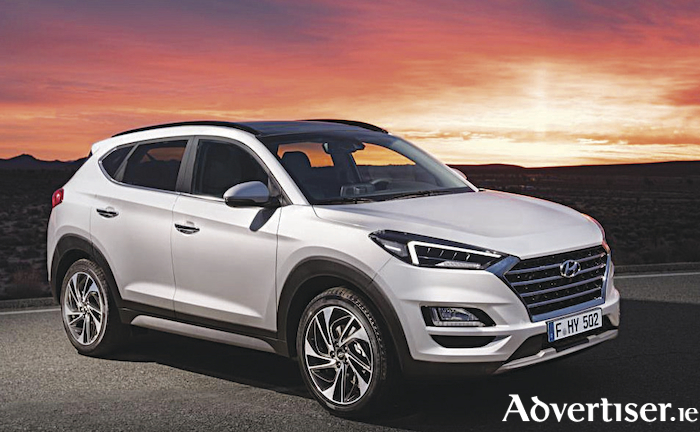 Andreas-Christoph Hofmann, vice president marketing and product at Hyundai Motor Europe, says the new Tucson brings a fresh look, creating a consistent appearance with the latest Hyundai models, as well as a series of enhancements to the driving and ownership experience. “With this major update, we expect the new Tucson to remain highly attractive to our customers, who consistently make it our best-selling model,” he says. The Tucson’s eye-catching exterior design is achieved by the cascading grille and a refined new light signature with full LED headlights as well as an uplifted front bumper, skid plate and a new wheel design. The car is also equipped with a new rear taillight as well as a redesigned rear bumper and muffler. By offering a combination of exceptional roominess, a highly ergonomic interior design and a wide range of advanced powertrains, Hyundai claims the new Tucson convinces with greater efficiency and driving dynamics. It is powered by two diesel and two petrol engines (specification differs by market ). All of them are revised to reduce size, and to further improve CO2-emissions. The most powerful powertrain in this line-up is the 2.0 diesel engine with an output of 137kW/186PS. This high-performance engine comes with four-wheel drive and can be paired with a six-speed manual transmission (6MT ) or optionally with the newly developed eight-speed automatic transmission (8AT ). Alternatively, customers can choose between the newly developed 1.6 diesel engines with two power outputs: the standard version is capable of 85kW/115PS and the higher power version offers 98kW/133 PS. Both engines are available with a six-speed manual transmission and front-wheel-drive. For the higher power version Hyundai can offer a seven-speed dual clutch transmission (7DCT ) and the choice of front or four-wheel drive. Hyundai says its new in-house developed 7DCT transmission is a state-of-the-art gearbox. Compared with an automatic transmission, it enhances fuel consumption, CO2 emissions and performance while maintaining its high shifting quality. To meet customers’ needs Hyundai also says the new Tucson is also available with two petrol engines. The1.6-litre GDI with a six-speed manual transmission and front-wheel-drive generates 97kW/132PS, delivering up to 130kW/177PS. The 1.6-litre T-GDI is excellent in terms of power and performance. It can be mated to a 6MT or a 7DCT, both available with front- or four-wheel drive. All new Tucson engines meet the new Euro 6c emission standards resulting in improved fuel efficiency by minimising drivetrain friction losses. A wireless QI based mobile phone charger and a seven-inch information screen, can support Apple CarPlay, Android Auto and Bluetooth connectivity. A standard USB port provides a further connection of the customer’s mobile devices with new Tucson. Another standard feature is the extra USB port in the rear, delivering additional power to recharge the devices on-board if needed. Hyundai says its latest SmartSense active safety and driving assistance features available in the new Tucson comply with the highest European safety standards: autonomous emergency braking (AEB ), lane keep assist (LKA ), driver attention warning (DAW ) and speed limit indicator function (SLIF ). Furthermore, the safety package includes Hyundai’s surround view monitor (SVM ), which uses cameras to provide 360° vision during reversing. Additionally bi-LED headlamps, the high beam assist (HBA ) and rain-sensing wipers provide high visibility at all times. Using front radar sensors, the Tucson’s advanced smart cruise control (ASCC ) keeps constant speed and distance from the vehicle ahead by automatically accelerating and braking to ensure an efficient and safe ride. The new Tucson will be on sale in Europe this summer.